Over the years, Rayark have made a name for themselves in the iOS community for consistently rolling out quality premium games on the App Store. 2015’s Implosion – Never Lose Hope ($9.99) was extremely well received both in our review and on the forums, and left us waiting for what the Taiwanese developers would astound us with next. VOEZ (Free) is, in many ways, a departure – it’s free to play and moves away from the exhilarating action based gameplay of Implosion. However, a return to rhythm games which initially solidified their reputation coupled with excellent production values and fresh spins on a tired and stale genre means Rayark have stuck to the formula which has won them over so many loyal fans. On first glance, the core mechanic of VOEZ may not seem particularly innovative or interesting. The game employs a similar style to Guitar Hero and the classic Tap Tap Revenge series from the inception of the App Store, in that notes come down a path from the top of the screen and you must tap, hold or swipe when they align with a target at the bottom. Changing difficulty between ‘Easy’, ‘Hard’ and ‘Special’ will change the frequency and complexity of the patterns that are launched at you, mirroring the music closer and closer as you advance the ranks. While this idea has been done to death, Rayark have managed to change up the formula to make it seem fresh and make it feel (as close as tapping a touch screen will allow) that you are actually involved in playing the songs. 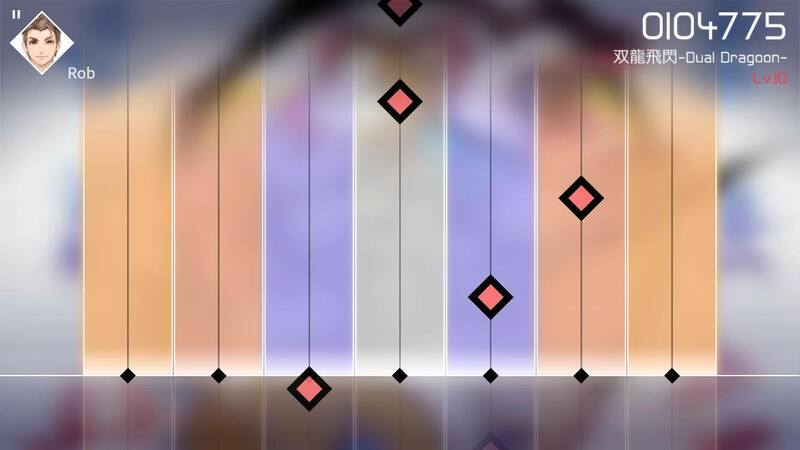 What makes VOEZ different is that unlike in Guitar Hero, the lanes are no longer static. During the song, it can change from one lane to three or six (even more if you’re playing on an iPad), which means as the music gets even more intense the gameplay can alter to compensate for this. Epic guitar solos are executed through sliding, as are turntable scratching noises found in the electronic-focused tracks, which makes it feel so much more fun to play. Even better is that actions such as swiping can actually create new lanes – for a music game without physical plastic controllers, it feels a lot more involved and interesting than the traditional tried and true touch screen gameplay. The speed that the notes hurtle down the paths can also be altered, and the quicker the speed you choose, the higher the score multiplier for the run. This means there is no difficulty ceiling, and gives an incentive to practice and risk turning up the tempo, which greatly increases the longevity of VOEZ as there’s always something to improve on. While these new mechanics are welcome, and the soundtrack has 40 songs of relatively varied genres from pop to dubstep and rock, the setlist doesn’t have any classic songs that you’d find in license-heavy games such as Rock Band. If you’re a big fan of certain niche music genres such as J-Pop some of your favourite songs could be on here, but for the majority of players there will likely be no songs that you are familiar with, which is a shame with such brilliant mechanics that would really set songs from Arctic Monkeys or Aerosmith alight. 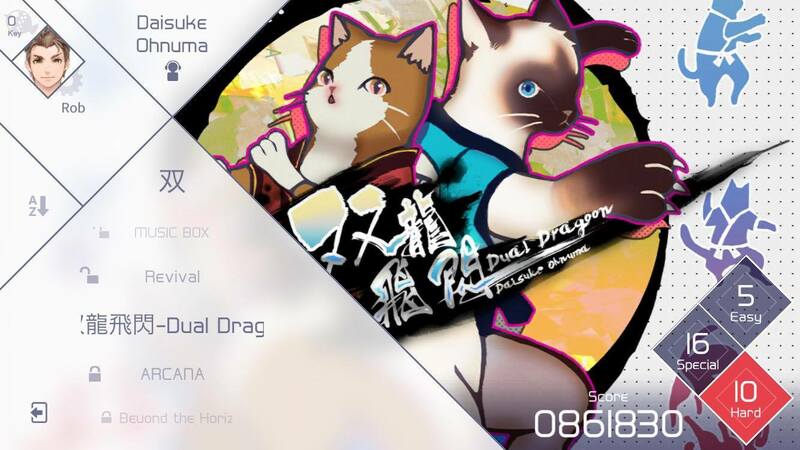 Another issue is that it can only be played with an internet connection, and as it is a free to play game, there are only 8 songs available off the bat, and they can be unlocked from the in game currency of 1 fish ‘key’ per song. However, these are available for purchase for $0.99 per key and a limited amount are unlockable by achieving certain challenges the game sets you, such as reaching a certain score on a specific difficulty. With the promise of new packs of free and paid songs, there should be enough to tide over any fans, and there aren’t any timers, barriers or ads that force you to pay to play. If this was where VOEZ ends, it would still be a highly recommended download for rhythm game fans. However, Rayark have created an anime-style story that works alongside the action and provides an incentive for you to beat high scores and keep playing. 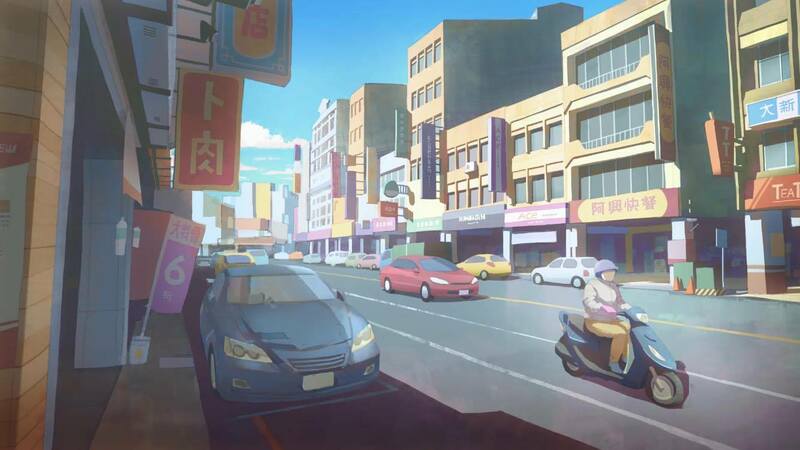 Immediately in the intro there is a fantastically well designed anime video which looks beautiful and helps to create the world in which the game is set, and really goes above and beyond anything you’d expect from the opening of a iOS rhythm game. After this, you can unlock through achieving challenges different chapters of the tale, which vary from artwork of places set in the world or stories about the characters who are attempting to make it big with their eponymous band ‘VOEZ’ while battling with teenage college life. The plot is by no means groundbreaking, and maybe a little generic if you’re a big anime fan, however it’s a very clever way of intertwining achievements with a story that gives you extra motivation to beat “Extreme Attack” with over 900,000 points on the hardest difficulty. While there are other minor features such as the ability to buy new avatars (which have no impact on the story), it’s not the ‘everything but the kitchen sink’ approach that makes VOEZ so much fun, even though Rayark must be commended for creating another complete, premium experience on the App Store. Instead, the game shines because of the way it does the core mechanics so well, and invigorates a stale genre that has been copied and churned out so many times since iOS gaming began in 2008. VOEZ manages to not fall flat, has proved to be a massive hit on our forums and hopefully is the prelude to a resurgence of innovative rhythm games on the platform.